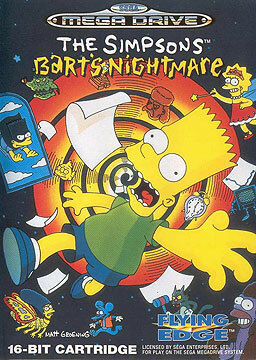 The Simpsons: Bart's Nightmare is a 1993 video game developed by American company Sculptured Software based on The Simpsons. It was released on Sega's Genesis and the Super Nintendo Entertainment System. Bart Simpson falls asleep while studying and wakes up in a strange universe where televisions and fairies roam the streets. The player must find Bart's lost homework and progress through the various levels to keep the homework pages and eventually return to reality. The game is split in two parts. The first is set on a street (probably Evergreen Terrace, but referred to as Windy World). Bart walks around and has to find pages of his homework while avoiding enemies such as living post boxes and various characters from the show. Bart can collect his skateboard, which acts as a power-up and temporarily increases the player's speed. Jimbo and his gang would coerce Bart into strolling with them, to which Bart would lose control of his movements and have to move with them, even having to take damage.Lisa Simpson with pixie wings would sprinkle fairy dust on Jimbo and his gang and transform them into rats, freeing Bart. However, if Bart is by himself, the Lisa pixie would turn him into a frog, where the frog Bart could not attack. If Bart caught a kiss blown to him by an old lady, it would revert him to his human form. Bart would also have to use bubble gum to blow a bubble to repel enemies as well as collect floating Z's. An important trick would be to catch Z's at opposite ends of the game screen which served as "goal posts", thus extending the level of play in the game. Principal Skinner occasionally appears and tries to dress Bart in his Sunday suit. If the player walks into Skinner, Bart will change appearance and become very slow and not be able to fire at enemies, however the suit will also protect Bart from all enemies and he will not take damage. The blue door: Bartman, where Bart flies over Springfield as a superhero. Along the way he fights many bosses, including Sherri and Terri in a hot air balloon, Barney Gumble on a pink elephant, Waylon Smithers, Jr. in a blimp (you face him twice), and eventually Mr. Burns in a biplane. Besides the enemies, Bart must avoid clouds of radioactive gas. Bart also receives soda bottles from Apu on a magic carpet in this level, which serve to raise his energy bar. The yellow door: Itchy and Scratchy, where Bart is being attacked by the "team up" duo, as well as various other household objects that become enemies (the oven shoots fire, the telephone explodes, Marge's Picture drops eyeballs, Pyro-Vacuums etc.) This is the only mini-game divided in two; Bart must play one half first and the other half next. The violet door: A journey into Bart's blood stream, where Bart must use an air pump to inflate and destroy germs. After collecting 5 atoms when the page is visible, the player wins. 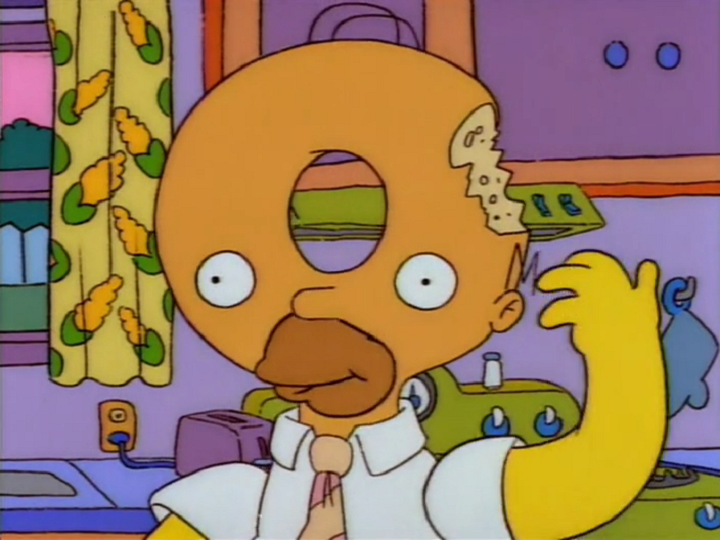 This mini-game has a cameo appearance from Smiling Joe Fission (a character from the first-season episode "Homer's Odyssey"). The orange door: Indiana Bart, where Bart must make through the balancing columns in "Temple of Maggie"
The green door: Bartzilla, where Bart must stomp through the streets of Springfield and destroy the army with fire breath and visual lasers, after being zapped by a shrink ray, Bart climbs the Springfield State Building and fights "Homer Kong" and "Momthra." The mini-games can be played in any order; the pages awarded will be 1 through 8 depending on the order they were retrieved. Upon either losing all the lives in the respective mini-game (and not getting the page back) or completing the mini-game (and receiving the page as a reward), the screen will flash back to Bart's room at night, which shows the amount of points the player has and the number of pages collected, while Bart snores. Once a minigame is completed, it will not resurface later in the game. If there is only one mini-game left, both doors will be the same color. The game ends when Bart dies (thus ending his dream) by losing all of his Zs (Windy World will be covered in a white fog, suggesting Bart is about to wake up) and taking damage one more time, or if he accomplishes all the mini-games. The first shot is a pic of Bart asleep at his desk in his room; if not all pages are recovered, Bart's homework will end in a scrawl, but recovering all pages will have the words "THE END" written on Bart's paper. Depending on how many mini-games Bart finishes and how many points he gets, he is awarded a letter grade. Bart will hold it up for the player to see, and then the different endings are shown where the players sees the Simpson family's reactions to Bart's grade by having the paper affixed to the refrigerator, which is strikingly similar to the final scene in Bart Gets an F. An "F" grade, the worst ending, would have the entire family upset at him, but a slightly higher grade would cause at least Homer to be pleased with Bart's work. Lisa would be annoyed with Bart's work unless the player manages to get Bart an outstanding grade. If one manages to beat all the mini-games and thus collect all the lost pages, the aforementioned room will turn from night to day, Bart will wake up on his own and the proper "ending" is shown. This mini-game oriented gameplay gave the game an arcade style. Although much of the game could be categorized as platformer, some of the mini-games could fit in the shoot-em-up genre, particularly the Bartman and Bartzilla stages. Mailboxes that trip you, if the player jumps over one they will receive points, watermelons, or gum. Basketballs that trip you, if the player jumps over it, it will turn into a skateboard, which if the player rides, they get free "Z"s.
Old ladies that try to kiss the player, if they do they will take points away. Fairy Lisas that will turn the player into a frog. Saxophones that make the player walk backwards. Jimbo, Dolph and Kearney will make the player walk with them, if they walk the player off screen the player loses the game. Televisions that will trip the player. Blinky the three-eyed fish that will trip the player. The Statue of Jebediah Springfield's head will trip the player. School buses will run the player over. Mud puddles on the road will slow the player down. Principal Skinner holding a suit will give the player the suit and will make the player invincible but considerably impairs their mobility. Company meddling during the development of the game prompted Bill Williams to leave the video game industry. Modified on April 19, 2017, at 13:54.